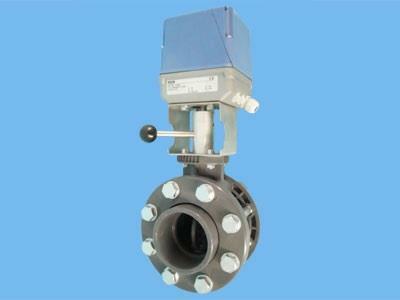 The Envalve butterfly valves are designed for shutting off or regulating flow. With an electric drive, they can be controlled remotely. The butterfly valves are manufactured from pvc and have an EPDM annulus, which makes them resistant to many aggressive substances. The valves are also available with a VITON® annulus. The Envalve butterfly valves are designed for shutting off or regulating flow. With an electric or pneumatic drive they can be controlled remotely. For operating the valve, the valve axle is connected to an electric driving motor. This driving motor has a supply voltage of 24VAC. On request, driving motors with a voltage of 230 volts can also be supplied. The driving motor can rotate in two directions and is controlled by the phase of the supply voltage. When you change the phase the valve will be opened or closed. The end position of the valve is limited by two built-in limit switches. The drive motors are bi-stable, which means that as the valve rotates to a certain position, the valve remains still at the time the power supply is interrupted. A position indicator on the drive motor indicates whether the valve has a large or small passage. The engine is equipped with a release button, which allows the drive to be disconnected and the valve can be put in a certain position using the control panel. The butterfly valves have flanges and flange adapters. The cuff also serves as a gasket.